Why not make yourself these fun festive earrings to jazz up any outfit. As a jewellery maker I have so many spare/left over beads from other designs, I decided to hunt through my stash to create these cute earrings. 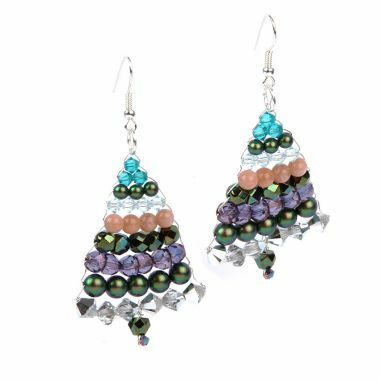 I found these beautiful swarovski bicones, pearls and Preciosa glass beads to play with and thought they would work well with creating sparkly Christmas Tree earrings. 2. Thread on three beads to the center of the wire, now thread your wire back through two of the beads (not through the middle bead), to create a triangle shape. 3. Keep adding beads to your design and going back through with your wire in the opposite direction. 4. Once you have added your final row of beads, wrap you wire around your design to secure it in place and trim any excess wire. 5. To finish the base of your tree, cut approximately 10cm of wire, thread on a seed bead and a larger bead of your choice. 6. Attach the wire by wire wrapping onto your design, trim any excess cord. Attach your ear wire using a jump ring.